“Footman,” a color etching and aquatint, is from Rouault’s “Fleurs du Mal” series of prints in the exhibit. WORCESTER — Mercy is not a theme we see much in art these drily conceptual days, or even in the last century. It’s easy enough to find outrage, furor, and passion in work by Picasso, Pollock, or de Kooning, but mercy has fallen out of favor. 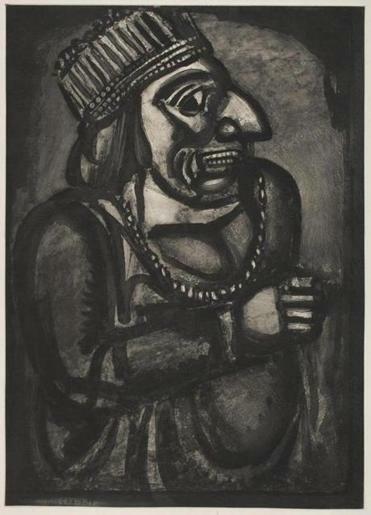 Works from “Miserere,” Georges Rouault’s masterly series of prints on just that theme, made between 1916 and 1927, are on view now at the Worcester Art Museum, along with selections from two other print projects, “Fleurs du Mal” and “Réincarnations de Père Ubu,” and a few others. All were commissioned by Rouault’s wily dealer, Ambroise Vollard. Rouault’s career had faltered, and Vollard came to the rescue around 1916, providing him with studio space in exchange for an exclusive contract. Rouault proposed two books of illustrated poems, to be written by his friend, poet André Suarès, on the subjects of mercy and war. Suarès, concerned that Vollard was exploiting Rouault, withdrew from the project, but Rouault continued on his own. The original plan was to produce 50 works on mercy and 50 on war, but ultimately only 58 were published, with more of them about mercy. Mercy was a central tenet of Rouault’s devout Catholicism. He associated with a Catholic renewal movement in France that proposed reviving the orthodox faith of medieval times. As an artist, he struggled to reconcile his spiritual convictions with the challenges of Modernism. Painting was becoming more abstract, less narrative, more about issues of surface and fragmentation. You could say it was becoming more about itself, and less about the human condition. For the exhibit “Mystic Masque: Semblance and Reality in Georges Rouault, 1871-1958” staged at the McMullen Museum at Boston College in 2008, curator Stephen Schloesser posited that Rouault and his compatriots were all after depicting a deeper reality than could be conveyed in most figurative work. 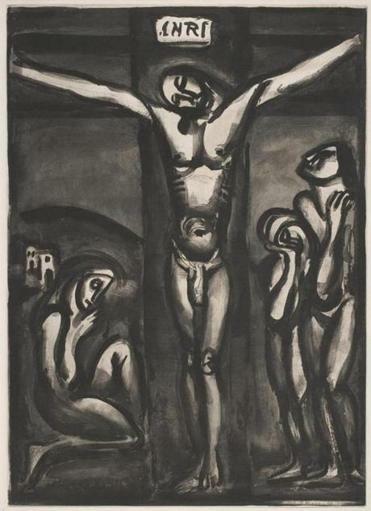 Where other artists sought it in abstraction, Rouault found that reality, that mystery, in Christ. The “Miserere” prints are dark, fluid, painterly works, compelling in line, tone, and texture, drawn in Rouault’s signature thick, dashy strokes, all in shades of black and gray. Most depict suffering. His several Crucifixion scenes display a tenacious conviction that mingles a faith in God with a faith in making art. The imposing “The Others You Love” shows Christ’s slender body suspended on a mighty cross, as figures rendered in muscular, expressive curves huddle on either side. These Crucifixion prints are the most explicit about pain inflicted from without. The others mostly go within. Making pictures of suffering is risky. It’s so easy to glorify or fetishize pain. Rouault succeeded in part because he was so simple, yet subtle and quirky, in his portraits, and because he took a democratic approach. We all suffer, regardless of station. We all go out in the world and mask our suffering. Rouault famously depicted prostitutes, clowns, judges, and kings — all, in his work, both hidden and revealed. In “Our Crowned King,” the figure looks trapped despite his finery, his teeth gritted, his downward gaze almost frightened. Rouault would make preparatory oil studies for the prints, and Vollard, a wheeler-dealer, swiftly had photo etchings made of the studies to sell. Ultimately, Rouault took the copper plates for those etchings and vigorously reworked them for the final series, which didn’t come on the market until after World War II. Nearly every inch of “Our Crowned King” has been worked over, in aquatint, drypoint, and more, textures refined, tones made eloquent. “Miserere” was Rouault’s own vision. The other series here were assignments from Vollard. “Réincarnations du Père Ubu” illustrated the dealer’s own sequel to Alfred Jarry’s theatrical satire about power, corruption, and greed, “Ubu Roi.” These Ubu prints fit into a grand tradition of social satire in printmaking; Rouault looked back to Honoré Daumier as an inspiration, and we can look forward to William Kentridge, and his scathing and funny contemporary take on Ubu. Rouault’s “Head of a Girl” from that series is frontal, commanding, filling the frame. Perhaps she’s a prostitute; she wears a sleeveless bodice and baubles around her neck; her eyes are closed above a small, almost pouting mouth. As in many of these prints, the character that this artist conveyed in very few lines is penetratingly peculiar. “Footman,” from the “Fleurs du Mal” series, is another example. In this series, the Catholic artist illustrated the work of poet and rapscallion Charles Baudelaire. Rouault’s take: that Baudelaire’s imagery evoked the gnawing need for God’s grace. Again, we have this odd Rouault cocktail of satire and compassion. 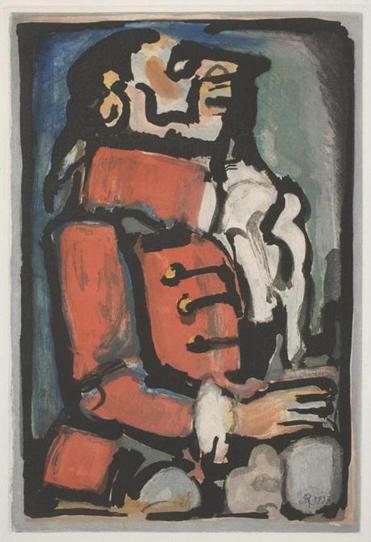 “Footman,” one of the few color prints in the exhibit, although still outlined in Rouault’s trademark heavy blacks, shows a servant bedecked in red with a ruffled shirt, his nose high in the air. He is prim, rigid, comical, and yet there is something just a little weary in the curve of his eyelid, in the set of his jaw. Museums in America snatched up the “Miserere” prints when they were published in 1948, as Rouault’s career hit its pinnacle. 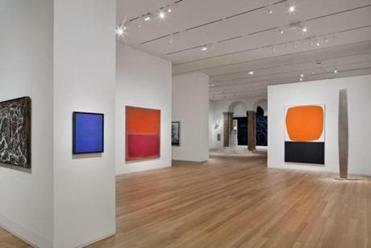 He had two exhibitions at the Museum of Modern Art, in 1945 and 1953. He died in 1958, at 86. But his work slid into the shadows as the irony and cool distance of Pop, minimalism, and conceptual art rose to the fore. Since the 50th anniversary of his death, in 2008, his work has garnered renewed interest. “Miserere” lacks the smoldering colors of Rouault’s paintings. Indeed, it strives to depict lives in ashes. The works are cannily expressive, yet spare, and it’s the artist’s restraint that makes room for the viewer to be moved.